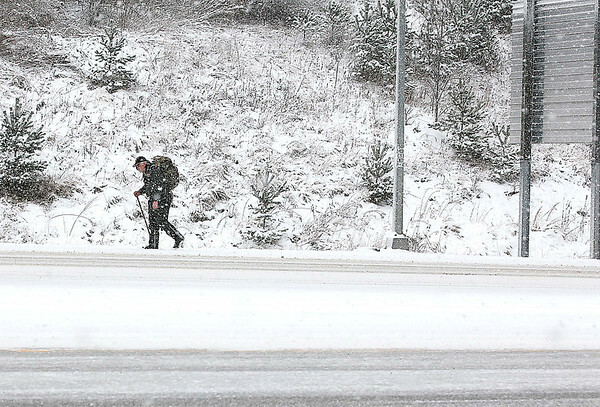 James Gryton Christian II, 59, hauls a backpack full of groceries as he trudges through the bitter cold and snow along Robert C. Byrd Drive between Crab Orchard and Sophia Monday afternoon. Christian, a Vietnam veteran who hasn't been able to drive since 2011 due to eye problems, makes a 5-mile hike from his home in Glen White to Crab Orchard three to four times a week anytime he needs to get groceries or handle any other errands. He was making his trip yesterday in anticipation of potential record low temperatures and more snow today that will have most area residents hunkered down trying to stay warm.